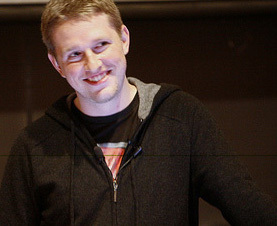 Matt Mullenweg is the 24 year founder of WordPress, an open source blogging and content management software. He was the keynote speaker this morning at the Northern Voice blogging conference in Vancouver. This is audio of his complete presentation, un-edited. Matt Mullengweg at the podium, Photo by kk+ Vancouver fashion photographer, bon vivant and all around nice guy who’s wicked with a lens. I’m a user and was a fan of WordPress before I met Matt. Hearing him speak has convinced me that one of the reasons WordPress has done so well is that Matt clearly keeps his eye on the goal; to make WordPress serve its users. His presentation may be based on his work at WordPress, but his ideas are equally relevant to web sites, magazines, radio, tv, and any other form of communication in existence today. Monique Trottier has a nice text summary of the presentation on So Misguided.